The Mir Castle Complex is a piece of military architecture which reflects the long confrontational history of the region. Its harmonious design shows Gothic, Baroque and Renaissance cultural influences. The 16th century castle has five towers made of alternating brick and large boulders. 3 meter thick walls link the towers. The castle was built by the Ilinich family to withstand attacks of the Crimean Tatars. The family died out in the same century, and the castle fell into the hands of a member of the Radziwill family. They had it converted into a Renaissance-style residential palace. In addition to the castle, the grounds also hold a chapel with the burial vault of the Svyatopolk-Mirsky Princes, a landscape garden with artificial lake and a Mir ghetto memorial. The last review on this website of Mir Castle dated from 2010. 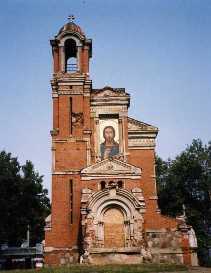 It is however the most prominent tourist attraction of Belarus, receiving 300,000 visitors a year. I went there on a day trip from Minsk, with a car and driver for the day (we also covered nearby Nesvizh on the same tour). Driver Roman was pleasant company, and he made sure that I was given audioguides in English at both locations to learn more about their backgrounds. This approach made the tour considerably less expensive than taking a guide in person with us for the day. Mir Castle only lies an hour away from Minsk, and is accessible from the country’s main highway to Brest (we fantasized that we could drive straight ahead, all the way to Amsterdam via Warsaw and Berlin, a drive of at least 1,700km). We arrived at Mir at the opening hour of 10 a.m. The reconstruction of the castle only has been finished since 2013. Entrance costs 10 BYN (New Belarus Ruble), quite expensive at 4.5 EUR: this is far more than the average main course in a restaurant in Minsk. Access to the interior of the castle is now one of the main attractions: 6 years ago it was still completely bare inside, now the rooms have been filled with objects commonly associated with European late medieval castles (canonballs, armoury, hunting trophies). There are also many portraits of the families who lived in this castle. Almost everything on show is a reproduction: the real valuables have long ago been carried away, to museums in Warsaw for example. Still it gives an idea of how it must have looked like. There’s even a reconstruction of the wine and beer cellar! Belarus has very few 'old' things left: both the First and the Second World War and the Soviet era are to blame. Only in 1991 they seriously started to renovate the castle, after it had been empty for decades and had served as a POW camp. The castle barely got in on the List: it is part of our infamous Inscribed at third attempt or more connection. During my pre-visit research (carried out between 5 and 6.30 a.m. in the morning of the same day that I went there! ), I found out that ICOMOS originally even had advised ‘Rejection’ at its first try in 1991. A study had confirmed that it was of “a type that is not uncommon in this area of Central Europe”, and they did not see sufficient quality. I spent 1.5 hours on site, taking in the castle’s interior, the brick chapel on the grounds (closed) and doing a full loop around the lake. Men were even fishing there. From the wooden bridge on the far side of the lake, one has the best view of the castle - with four of the five towers in sight. The very different design of these towers clearly is the castle’s Unique Selling Point. In the course of the morning a lot of other visitors had arrived. All three car parks were fully occupied when I returned to the gate to drop off my audioguide. Most arrivals seemed to consist of Belarusian day trippers. The influx of Western European tourists, as is seen in Vilnius for example, is still far away here. As my first world heritage site of 2018 I settled on Mir Castle. Belarus had been on my to visit list for a while, ever since they dropped the visa requirement for visitors of less than five days flying in via Minsk airport. And thanks to a good offer by Lufthansa I boarded the plane Friday evening and ventured to Minsk... In February. Now this may not come as a surprise and my picture of Mir castle already strongly hints at it: February in Belarus is still winter. The weekend I came was particularly cold with degrees falling to as little as -15 degree Celsius. Hiking around Mir Castle trying to take pictures was quite the challenge as my hands strongly objected to taking off the gloves. But the snow covered landscape gave the excursion a nice feel. Of itself, Mir Castle is nothing spectacular. It's a castle reminiscent of Malbork or nearby Trakai, but in worse state of preservation. Over the centuries it has undergone multiple refurbishments and reconstructions. There are regular direct busses from Minsk running to Mir Castle. Alternatively, you can try to travel by train to Stoubcy and take a cab from there. However, if you plan to visit nearby Nesvizh (you should), are short on time or not fluent in Russian, I would recommend getting a private driver or join a tour. I paid 100€ for the round trip by private car. I did not haggle, so you should be able to pay less if you have time. A visit to nearby Nesvizh is a must. I would also recommend visiting Minsk. Rebuilt after World War 2 in Stalinist style it's a very interesting site and would make a worthy addition to the list. Quite how this ended up on the World Heritage list I’m not sure. Whilst it is a fairly pleasant place, it seems to be pretty unremarkable. When we visited there were fairly large crowds of Russian tourists waiting to clamber up one of the Towers, we joined the queue and were left wondering why. There was almost nothing to see inside the castle and you couldn’t even get a good view out. The rear side of the castle has gone through some pretty heavy restoration, in preparation of being turned into a hotel. The most impressive thing about the castle was the exterior, especially when viewed from the other side of the ornamental pond. To pick up on Christer’s comments below, I would say I was in full agreement with this. Whilst the sites we visited in Belarus were quite some way from being ‘World Class’ the country itself was a bit of a surprise. We visited it partly to see ‘the grim last remnant of the Soviet Union’, but actually found a fairly prosperous, very modern and extremely friendly country. The roads leading to Mir from Minsk and Nesvizh were absolutely superb, and by far the tidiest highway I have ever been along. Mir was not a particular highlight of our trip, however getting to see something of the country outside Minsk made this a worthwhile day trip when combined with nearby Nesvizh. In 1895 Mir Castle became the property of my family, the Princes Swiatopolk-Mirski, and remained in our family’s ownership until the outbreak of WW II in 1939. I first became aware of the existence of the castle thanks to the photographs which hung on the wall of our house among the family photographs, but more especially so because my mother stayed with Prince Mikhail N. Swiatopolk-Mirski, who was the owner of the estate - and my great-uncle. My maternal grandfather also lived there. 1st September 2002 was a Sunday, the weather at Mir was superb - a beautiful sunny day - which became even more memorable for me since it was the first time that I met and embraced my cousin from London, Maria Princess Swiatopolk-Mirska. We share the same grandfather - Prince Ivan Nicolaevitch Swiatopolk-Mirski. On this day I also had the very moving experience of entering the castle through its beautiful doors and kissing its portals with tears in my eyes. After all, Mir was the family home. And so for the first time, together with my cousin, I proceeded to enter the family chapel, where we both knelt and prayed among our ancestors who are buried there. 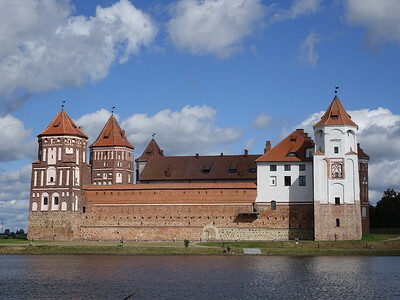 I visited Mir Castle in 2002 and in 2005 on the invitation of the Belarus Embassy in Warsaw, in conjunction with the National Art Museum of Belarus. An exhibition of my photographs can be seen at Mir Castle. The photos are only journalistic snaps of a moment frozen in time, as they were taken in a hurry since the programme of the visit to Mir was confined by a very tight schedule due to Princess Maria and I being involved in press and radio interviews. We both took part in a documentary film about the descendants of the Swiatopolk-Mirski family, which was broadcast on state television under the title: “Man’s Fate”. We also participated in the various celebrations which took place in the vicinity of Mir Castle. Outside the castle so many interesting events that simply pleaded to be photographed were taking place! Against the backdrop of beautiful and colourful scenery the history of Mir Castle was presented through a recital of poetry interspersed with songs and dances. In addition to the numerous stalls of the country fair there were knightly jousting tournaments. This festive, colourful and lively event merited a much more detailed photographic record. However, whatever I did manage to record with my camera I subsequently donated to the exhibition - which you are cordially invited to view. I visited Mir castle twice, first time in july 2001 and again in july 2006. on both occasions my wife and I were working for a U.K. charity improving the town hospital (just round the corner and up the hill, or at the rear of, the castle) In 2001 we had a guide, Valeriy, husband of Janna Brandt, hospital director. He took us around and explained the history of the castle et.c. In 2006 we just walked by the lake without taking advantage of the tour. Very impressive building and so good that it is being looked after and restored. The people of Mir are lovely, we made some good friends. Belorussia might be considered to be the last communist state in Europe but despite its dictator Lukashenka and all it is actually a very friendly, nice and partially also a very modern country. 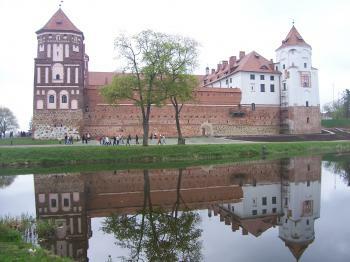 During a cold week in November, when staying in Minsk, I hired myself a guide and a driver to take me for an excursion to the two World Heritage Sites of Belorussia – The “Mir Castle Complex” and the “The Architectural, Residential and Cultural Complex of the Radziwill Family at Nesvizh”. in 1998. The site is impressive. Not only the castle and lake but also the chapel behind which is worth seeing. The people working there do a really great job. I visited it on a rainy day in March this year, but that was still a very special day. It reminded me of small French castles in the Poitou Charente region that I have seen, though its bigger in size and has a different style. At the present you can visit only one tower of the castle, the rest is being restored. The small town of Mir is very pretty too. The trip from Minsk (the capital) by bus takes about 2 hours. By public transport: buses leave from Vostochny (Eastern) Bus Station in Minsk for Korelichi, Novogrudok, Dyatlovo, Lida (via Novogrudok), which will stop in Mir. It takes ca. 2 hours. Or by a rental car or car with driver from Minsk (1 hour). 68 Community Members have visited.